A diabetes cure could be in sight after scientists transformed ordinary skin cells into pancreatic cells producing insulin. Scientists used a step-by-step technique to reprogramme skin cells called fibroblasts taken from mice. At the end of the process they created immature precursors to pancreatic beta cells, the body’s insulin ‘factory’. When these cells were injected into mice genetically engineered to mimic symptoms of diabetes, the animals’ blood sugar levels returned to normal. The U.S. research is a major step forward in the hunt for a stem cell solution to type 1 diabetes, caused by the body’s own immune system attacking and destroying insulin-making beta cells. Around 300,000 people in the UK have type 1 diabetes, which is distinct from the much more common type 2 version of the disease. 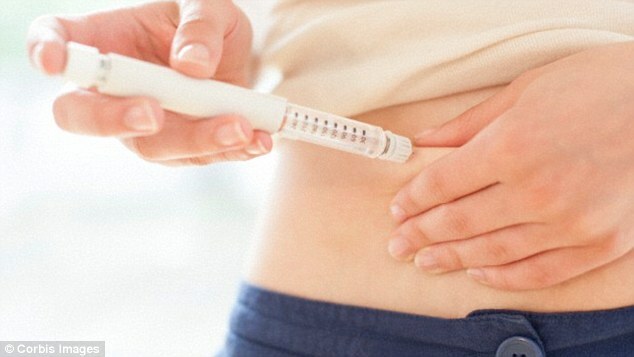 Type 1 diabetes usually strikes in childhood and dooms sufferers to a lifetime of self-administered insulin injections, without which their blood sugar would reach lethal levels. Earlier attempts at using stem cells to replenish lost pancreatic beta cells have been largely disappointing. Professor Sheng Ding, from the Gladstone Institutes and University of California at San Francisco (UCSF), said: ‘The power of regenerative medicine is that it can potentially provide an unlimited source of functional, insulin-producing beta cells that can then be transplanted into the patient. A major challenge to generating large quantities of beta cells is that they have a limited regenerative capacity. Once they mature, it is difficult to increase their numbers. Professor Ding’s team overcame this obstacle by stepping further back in the cell’s development. The researchers first collected fibroblast skin cells from laboratory mice, then used a cocktail of chemicals to reprogramme them into immature ‘endoderm-like’ cells. Endoderm cells are stem cells from one of the three primary layers of an early stage embryo. They eventually mature into the body’s major organs, including the pancreas. A second chemical cocktail was used to nudge the endoderm-like cells into a further stage of development, causing them to take on the properties of early pancreas-like cells, or PPLCs. ‘Our initial goal was to see whether we could coax these PPLC’s to mature into cells that, like beta cells, respond to the correct chemical signals and, most importantly, secrete insulin,’ said co-author Dr Ke Li, also from the Gladstone Institutes in California. The scientists then injected the PPLCs into mice modified to have high levels of blood sugar, a key indicator of diabetes. One week later, the animals’ blood sugar began to decrease until it approached normal levels. When the transplanted cells were removed, there was an immediate glucose ‘spike’, showing a direct link between the treatment and blood sugar control. Two months after the cell injections, the PPLCs had given rise to fully functional insulin-secreting beta cells in the mice. The ground-breaking research is published online in the journal Cell Stem Cell. ‘These results not only highlight the power of small molecules in cellular reprogramming, they are proof-of-principle that could one day be used as a personalised therapeutic approach in patients,’ said Dr Ding. Επιστήμονες στις ΗΠΑ έκαναν ένα σημαντικό βήμα για την εύρεση μιας θεραπείας του διαβήτη τύπου 1, καθώς αναπρογραμμάτισαν βλαστικά κύτταρα που είχαν πάρει από το δέρμα πειραματόζωων και, στη συνέχεια, για πρώτη φορά κατάφεραν να τα μετατρέψουν σε λειτουργικά κύτταρα παγκρέατος που παράγουν ινσουλίνη. Πρόκειται για σημαντική πρόοδο στο πεδίο της αναγεννητικής ιατρικής, η οποία μπορεί να οδηγήσει στην αντικατάσταση των κυττάρων που καταστρέφονται από τη νόσο, ελευθερώνοντας έτσι, κάποια στιγμή στο μέλλον, τους διαβητικούς ασθενείς από την υποχρέωση να κάνουν ενέσεις ινσουλίνης καθ΄ όλη τη ζωή τους.